EN: Tell us a little bit about yourself. Tom: I work in Salem, Oregon as an anesthesiologist. My very patient and loving wife supports me through the craziness of this sport. I have 2 sons, the oldest married with 2 foster children, a 16 month old and another on the way in May! The highlight last year was doing a local 5K with my granddaughter! As far as I could tell, she had a blast. My younger son is in college. He’s starting to catch the endurance bug as we are going to do a half marathon together in May. EN: When did you start racing triathlons? Tom: I started racing triathlons in 2003 and quickly came to love the sport and what it represents. EN: What do you love most about triathlon? Tom: I love the consistent training and always feeling like I’m in the best shape of my life. My competitive nature always wants to better my previous times as well as my competitors. Ironman® Canada 2005 was my first Ironman and Ironman® Texas 2014 was my 10th Ironman®. In addition I’ve completed numerous half ironman’s, marathons, half marathons as well as multiple shorter distance triathlons. EN: When did you join Endurance Nation? Tom: I joined EN in January 2014 after listening to a few of the coaches podcasts. After trying to learn things on my own through the years, I realized they knew what they were talking about and I wanted the flexibility of semi-self coaching. EN: What are your goals as an Endurance Nation Ambassador? 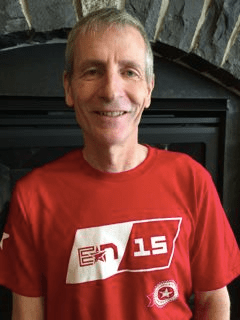 Tom: As an ambassador, I hope to promote EN to local tri club members especially those that have taken the long distance plunge. I’m active in my local tri club and have already given a couple talks on long course racing promoting EN to those who attended. As the weather improves, I hope to reach out to the other EN members in Oregon and either connect for training rides or at local races. EN: What are your current PR’s that you want to smash this season? Endurance Nation is honored to have an all star Ambassador Team this 2015 season. Look for them in races across the globe, racing, promoting and encouraging others in the sport of triathlon. Feel free to reach out to any of our 12 Ambassadors if you have any questions about Endurance Nation or live in their area and wish to have a training partner.